Trying to find a crowd control system that does the job of forming people in queues while coordinating with your décor? These rope barriers offer classic styling and quality you've come to expect. They are a must have for many businesses, including banks, cafés, museums, casinos, theaters, and convention centers. Rope barriers with attached signage easily make an orderly line from a chaotic group of people or help to guide them in a specific direction. Metal stanchion posts like these are also able to keep people out of a restricted area or they can decorate a grand prize in a contest, like a car or locked safe. 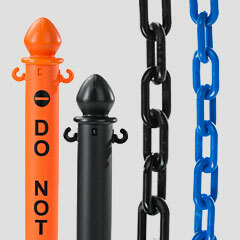 No matter how they will be used there are a large number of rope barriers to match your specific needs! What are some of the features of these crowd control fixtures? 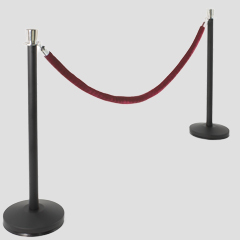 Stanchion ropes are composed of soft foam middles with velvet or velour sewn around them, while the twisted nylon style creates a look of both simplicity and strength. The connector clasps on the end of each unit is the same. 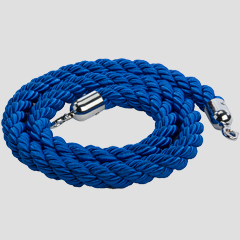 The cords feature cupped ends with spring-loaded hooks that need to be clipped into place. 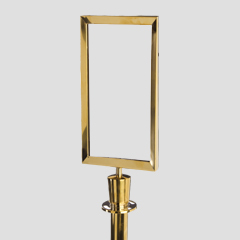 Posts are available in gold-look brass, black and silver as a standalone option. Wall mount units are easily installed when poles are not an option for your space, or when a more permanent queue end is desired. How can sign holders improve queue management? The main reason is to help parties, events, and everyday operations be more organized. Clearly marked lines will help keep people orderly, especially when there are to be many present at one time trying to enter maybe a single entrance. 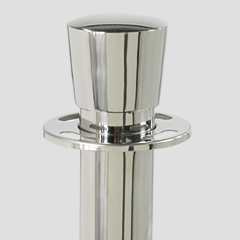 There are several rope post finishes to choose, such as stainless steel or brass with a polished or brushed texture and black with or without powder-coating. In addition to special event use these accessories are great for everyday use at museum exhibits, movie theaters, or concert venues. 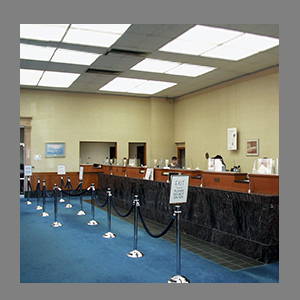 Soft stanchion ropes create the classic look of what a queue management system should be. They are all made of stainless steel and come in either black matte, polished chrome, polished brass finish, or a mix of black and silver. There are several head styles available as well, standard roundheads and flattened models just above where the sash hooks in. These posts & ropes are very portable weighing less than 20 pounds per stand. They all have either chrome or brass clips on both ends that fasten easily to poles. Rope stanchions have 4-way heads as well and allow up to 4 ends to be clipped onto one upright. The velvet cable measures 6.5’ long and when the poles are placed 6’ apart, they fall exactly right at 2” or more off the ground. Because these sets appear more upscale they are ideal for grand openings, exclusive ceremonies and events, red carpet walks, high-end museum exhibits, and casinos.